Discussion in 'Lets Talk about gambling and more...' started by Kotsy, Nov 6, 2014. I guess this player didn't heed the warnings or he did and must have been on a winning streak and couldn't walk away? 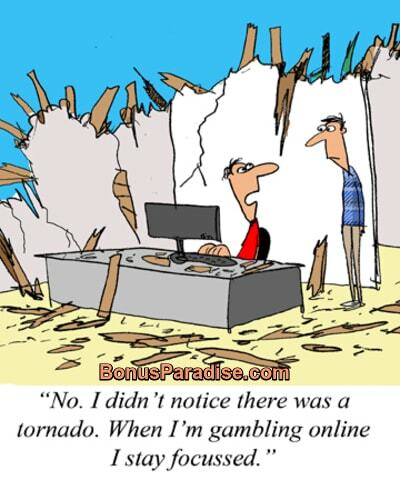 But, it goes to show how strong Online Gambling is. It withstood a tornado as he and his computer emerged intact and his reels are still spinning. Love it. That would surely be me. If I am playing online I need to concentrate a bit lol and I can't do this on my phone with a small screen. OMG Peeing my pants hahaha. Yup that's me! Great cartoon again friends! Kotsy, Marina and Mike like this. But I must say that I have this with everything. Also when I play a Video game or browsing the forum lol. Gambling & smoking mostly always ended with burnt fingers for me. Just forgot that I had a ciggie in my hand.. . Another good reason I stopped smoking.